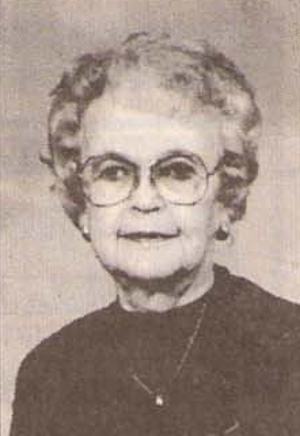 Obituary – Dolezal, Lydia Helena (Freese) « Perry High School Alumni Association, Inc.
﻿Lydia Helena Dolezal, 90, Perry, died Monday, Nov. 18, 1996, at Manor Care Nursing home, Midwest City, where she had been a resident since October 1, 1996. Funeral will be at 10 a.m. Friday at the First Presbyterian church in Perry with Rev. Jim Murray officiating. Burial will be in Grace Hill cemetery under direction of Brown Funeral home. Casket bearers will be Steve Bruner, Doug Bruner, Mark Livesay, Steve Guymon, Don Thiery and Darren Freese. Honorary bearers will be Robert Kasper, Harry and Leona Elwell, Wayne Casteel and Gene Wood. Memorials may be made to the American Heart Association or to the Cherokee Strip Museum of Perry. 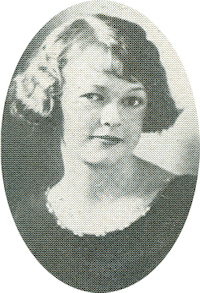 Mrs. Dolezal was born on March 8, 1906, near Cordell, the daughter of William and Clementina Freese. When she was two years old, she moved with her family to a farm seven miles northwest of Perry. She attended Whipple and Lone Star rural schools in Noble county and was a 1924 graduate of Perry high school. She graduated from Draughon’s Business College in Oklahoma City, then was employed in the Noble county clerk’s office until her marriage on Nov. 8. 1930, to Joe E. Dolezal Jr. of Perry. The couple established their home at 1111 Seventh street in Perry. Mrs. Dolezal was a member of the Marigold Garden club, Business and Professional Women’s club and the Noble County Republican Women’s association. She served as volunteer and board member of the Cherokee Strip museum, was a member of the board of trustees of the First Presbyterian church and served as treasurer of the Presbyterian Women’s association. After her husband’s death in 1958 Mrs. Dolezal was employed as a legal secretary for the law firm of Robert L. Kasper and David C. Matthews. She retired in 1976. In addition to her husband, Mrs. Dolezal was preceded in death by one daughter, Barbara Kaye Bruner, her parents and one brother, Henry Freese. Among survivors are one daughter, Jo Ellyn Livesay, Oklahoma City; nine grandchildren, Steve Bruner, Tehachapi, CA, Cindy McMullin, Bishop, CA, Doug Bruner, Barstow. CA, Becky Featherstone, Vancouver, WA, Joseph Bruner, Kailua, HA. Leah Bruner, San Diego. CA. Lezlie Thiery, Edmond, Suzanne Guymon, Memphis, TN, and Mark Livesay, Dearborn, MI; 14 great-grandchildren and numerous nieces and nephews.